Perfect oceanfront condo in West Maui. Relax on the lanai or take a stroll down Ka'anapali Beach with warm sand on your feet or stroll on the wooden boardwalk extending for miles. Imagine yourself on your own cruise ship heading for the islands of Molokai and Lanai but without any motion, without any rush but with all the comforts of a tropical home! Take your time-relax at your own pace. 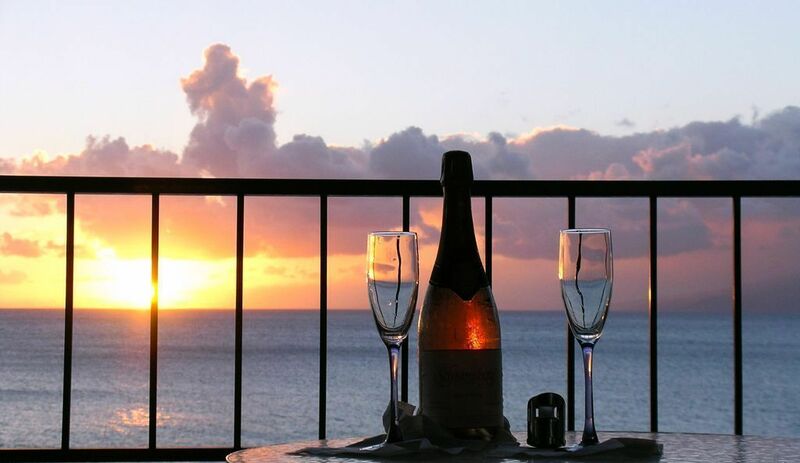 You'll feel a sense of privacy that our center location 504 offers that makes our lanai an incomparable location for your honeymoon, anniversary, birthday celebration or just for the sheer joy of being on Maui! Whether it's the soft pinkish lavendar glow of sunrise or the dramatic reds, oranges, and purples of sunset, you'll marvel at the cloud formation that the Trades pass by for your enjoyment. Watch the spinner dolphins dance by and the tropical fish dart about in the reef or even green sea turtles pop their heads up in the early morning. Marvel at the grace and immensity of the Humpback whales during the winter season. No matter what time of year, you will be entranced. nside Maui Kai 504 is a treat for your eyes! Step through the front entry and feel the pull to the enticing lanai! Gaze through newly upgraded double-pane tinted large lanai doors that open with a finger's touch! The chaise lounge awaits as does the balcony high table with swivel chairs, but take the time to RELAX...outside or inside with the living room offering soft beautiful comfort, electronic entertainment and Wifi. The desk is there when needed. The kitchen, fully stocked with everything from waffle maker, blender, to rice cooker, spices and herbs has everything needed to concoct a delicious libation or gastronomic meal. Enjoy the artwork, reminders of your tropical setting...Honolua Bay, green sea turtles, Lahaina harbor and whales. Finally, the high end king bed that many guests inquire as to where they too can find and buy for themselves! A blissful night's sleep awaits to the music of the waves. That is Maui...that is 504. Comfort, relaxation, and a smile. It's what Al and Lyn want for your extra special experience...and it's what you'll find written throughout their guest books. Find out for yourself. Very well stocked condo with a gorgeous view on the water. We saw whales from the balcony most mornings. Weather was perfect. We went to Maui in February 2019, for my 50th and for the fact that we wanted to see the whales. This condo is directly on the water with a wonderful view and quaint lanai. This condo was stocked very well. Unfortunately, the one thing that it doesn't have is a washer/dryer inside the unit. There are coin operated washer/dryers on each floor that you will need to share with the other patrons of the condo complex. When we booked this condo, we overlooked this because we saw that it had a washer/dryer, but it denotes "on site". So, if this is a big deal to you (and it is for us), make sure that you pack enough clothes for the duration of your trip, if you don't want (or don't mind) using the coin operated (shared) washer/dryer. If you want to be directly on the water with the sound of the waves each day, this would be just the place for you. We have lost count of the number of times we have stayed at the Maui Kai Condo #504. We just know that we ALWAYS want to return. We feel so welcome when we step through the door. Then there is that giant blue ocean view that pulls us in and makes us want to stay forever. We always have a perfect visit. We will return to Tahoe with snow on our mind and 504 and Aloha warmth in our heart. Thank you to Al and Lyn for all that you do to make our stay at Maui Kai #504 so very special. See you next year with bells/ flip/ flops on. The Maui Kai could not be closer to the water. We enjoyed nearby beaches by day, spectacular sunsets and fresh , delicious local fish from the nearby Fish Market. The view from the lanai is like being on an ocean liner. We viewed a lot of whale activity, as well. Check in and out was efficient. Loved sleeping to the sound of the waves and the fresh air coming in the windows. Thanks for a lovely visit. Condo was in great shape - well equipped with everything a person would need. The location is very convenient to shopping, Farmer's Market, beach parks, etc. I would highly recommend this condo to anyone. *The simple pool. Larger resorts have fancy pools with amenities, but this simple pool served its purpose.